When I rode Honda’s super-limited edition hyper-missile RC213V-S at Valencia in Spain, I was surprised by the noticeable change in brake performance between the street and Sport Kit equipped versions. The Honda engineers told me that the only change was to the front pads, with the Sport Kit utilizing Brembo’s racing 04 pads. I had no idea brake pad compounds made that much difference! Curiosity aroused, I later talked to SBS Brand Manager Chris Jensen about trying some different pad grades on my Suzuki GSX-R1000 to see if I could improve things a bit. The bike is equipped with aftermarket Brembo radial calipers, the stock Suzuki radial master pump at the handlebar, and braided lines linking them together. The stock Brembo TT 2172 HH pads are about half worn. They have always had really good feel and worked very well on the street, but at track days (I’m typically a fast B Group/slow A Group guy) the brakes lacked some power and could even feel a little mushy after some hard laps. I had become used to adapting and going from two-finger braking on the street to using my full hand when at the track, but I was curious if I could improve things through nothing more than a pad change. SBS (Scandinavian Brake Systems) is a Danish company founded in 1964 that makes all its products in a state-of-the-art factory in Svendborg, Denmark. Its stringent ISO 9001:2000 certification guarantees a perfectly consistent product, and the NRS mechanical bonding process they use is unique to the industry. This is where the pad material is mechanically fixed to the metal backing plate by a matrix of hooks. SBS claim it is much superior to adhesive bonding, and makes it totally impossible for any kind of delamination between the friction material and the backing plate. Good. That’s what I like to hear–especially since we’re talking about my brakes. 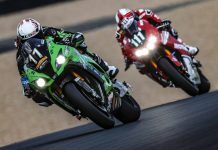 SBS has been supplying World Superbike teams with pads since the Championship’s inception, and as you might suspect, multiple National and World Championships have been won using SBS pads. Actually, the list of SBS partner riders reads like a Who’s Who of Racing for the last 30 years; for your edification I have pasted the list at the foot of this story. Suffice it to say, SBS knows what it’s doing. Although SBS makes pads for every type of motorcycle (including street, cruiser, scooter and off road), for my purposes Chris recommended testing three types of street/track pad: the RS Racing Sinter (recommended for both street and track); the DS Dual Sinter track only; and the DC Dual Carbon race pads as used by many WSBK race teams. The three versions address escalating levels of performance, with the last two strictly for track use only. The DC Dual Carbon pads are really for racing use only (approx. $53 each caliper, or $106 a set), and they actually coat the rotors with a film of carbon designed to emulate the pure carbon brakes exclusive to MotoGP. Although not quite the same obviously, they do however give significantly more braking power than any typical metal sintered pad. However, like the MotoGP brakes, they also need a lot of heat to work properly—-hence the track-use only requirement. The downside for my testing purposes is that the rotors have to be cleaned with emery cloth in order to help the carbon film adhere. Since I would have limited time testing at the track I decided against testing those for now. My first session on track was partially to reacquaint myself with Chuckwalla Raceway and to also to establish a baseline for braking performance using my usual Brembo pads. Chuckwalla does not have any long straights so the maximum speed I saw was around 145 MPH, however there are a couple of hard braking points each lap that made for good places to test my brakes. My stock Brembos performed like normal, and as I’m used to them, I was fine with the braking they provide; I certainly don’t have anything bad to say about them. As noted before, as the session went on and brakes became hotter, they started to feel a little soft, but overall the brakes maintained good feel and the performance is a known quantity; so I had no surprises. After returning to the pits and allowing the brakes to cool, I replaced the Brembos first with the SBS Track & Sport RS Sinter pads. These used to be the SBS spec pad for both Supersport and Superbike racing in the late 90s, making it the perfect compromise pad for both street and track use now. If like me, you do occasional track days and a fair bit of street riding, these pads are ideal, and at approx. $45 per caliper ($90 a set) they won’t put the brakes on your bank balance either. Interestingly, I didn’t have to adjust the brake lever position as the reach still felt right for my fingers; just a couple of pumps at the lever to tighten the pads on to the rotors after fitting, and they were ready to go …er… stop. The feel of the new pads was immediately noticeable. The brakes felt slightly harder than the stock ones in as much as they needed a little more force at the lever, but the initial bite was perfect, with the brakes not being grabby at all. Feel was ideal for my riding, and coming off the back straight into the slow chicane of Turns 8 and 9, the SBS pads gave me a lot more braking power than the Brembos. I would describe the Brembos as linear, in as much as the brake power doesn’t build per se. To get more stopping power, you add a lot more lever pull. The SBS pads felt more progressive. In other words, as pull is added at the lever, the amount of braking power multiplies on itself—so less lever travel is needed to effect full force braking. This might sound a little intimidating, however since the pads have so much feel and the feedback to the rider is so good, I always received exactly the amount of stopping power I wanted, no more, no less, and they didn’t have any over-braking surprises on initial application. The braking system as a whole felt less stressed using these pads; even under fairly extreme load the lever never came back that far and I was able to stick with my preferred two finger style braking. I used the RS Sinter pads through until our lunch break, and the performance didn’t change one iota in the whole test. On one particularly long session—-which must have had the brakes getting pretty hot—-the performance of the SBS pads didn’t degrade at all; they were exactly the same on the last lap as they were to start with. After lunch, and with the brakes now cool once again, I fitted the WSBK compound DS Dual Sinter pads—-labeled as strictly for race use only. Chris Jensen had explained that this was because they need heat to work properly. He also explained that they can be noisy and a little harder on the rotors when they’re cold; I also noticed later that they created a lot of brake dust residue and even left some spotting on the rotors. Introduced in 2007 specifically for use in World Superbike, Supersport and Endurance, in SBS’ first season the DS Dual Sinter pads won both the two sprint championships, and completed both the Le Mans and Bol d’Or full 24-hour race distance. Clearly these pads are designed to generate huge braking forces consistently throughout a long race, and without wearing out too fast. These pads are considerably more expensive than the RS Sinter pads, and come in around $140 per caliper ($280 a set). On track the difference at the controls was immediately noticeable, and quite considerable. I’d describe the pads as feeling a lot ‘harder’ than the RS Sinter pads, and although there was still plenty of feel at the lever they definitely needed more input, although they certainly reacted well to finesse and didn’t need me to be ham-fisted. The effectiveness definitely increased once they were hot too. The difference isn’t huge, it’s not as though there isn’t any braking on the out-lap, but it is a noticeable improvement once the brakes heat up. When you get really aggressive with these pads, they shine, and of course that’s what they’re designed for. Neither my level of commitment nor Chuckwalla challenges the Dual Sinter pads the way a committed racer at somewhere like Road America or the Isle of Man would, but for the purposes of this test I could feel the potential. I can understand why they have such strong support at the world class level. I did notice that in a couple of the slower corners the pads would squeal a little, but I put that down to simply not stressing them enough on this particular course. The entrance to Turn 14 did give me one small moment, and I mention it because the SBS pads came through with flying colors. I got a little greedy on the throttle coming out of the bowl and arrived at Turn 14 a bit faster than I’d been used to. My excuse is that I didn’t know the track well, but the truth is I should have taken longer before getting brave. Be that as it may, I gave the DS Dual Sinter pads a hefty squeeze—with an element of panic I admit—the front Q3 yelped briefly, but I made the corner. Clearly if the DS Dual Sinter pads hadn’t had the requisite feel in initial bite I’d have been on my head, and this unplanned test proved to me that these pads work amazingly well—without sacrificing feedback to the rider, even in a bit of a panicky situation. I have now subsequently used the SBS RS Sinter pads on the street as well, and my enthusiasm is undimmed. The brakes have loads of feel even at around-town-street-heat levels, and stopping power is exemplary. I also tried the brakes on my usual long canyon run into the mountains above LA. It’s a round trip of around 250 miles and while the speeds are relatively modest in the lower hills things get progressively faster as the road gets into the real desolated areas. Being winter time, naturally the temperature is a little chilly and at altitude it was dropping into the forties. I mention this because I did find that partially because this particular road has long stretches where no braking is required and partially due to the low ambient temperature, the brakes effectively become completely cold. I would then find myself reaching a high speed corner where a little braking was needed–and the pads of course were not up to temperature. Because the braking zones were so few and far between, and because my lever input was so mild, the braking was over before the pads had a chance to warm up, resulting in some initial lack of bite. Although the first time surprised me a little, after that it wasn’t a big deal as the brakes ultimately did not lack effectiveness, they simply needed a bit more pressure for a second or two after initial application. In the warmer temperatures of Spring and Summer of course this won’t happen. Bottom line for me is that the RS Sinter Road/Track pads are ideal for my level of speed and usage on both track and street. A bonus is that they’re nicely inexpensive! Frankly the extra involved for me to go to the DS Dual Sinter pads is simply not worth the considerable extra expense, not to mention the lack of usability on the street. If you’re a serious racer and need the best available stopping power without losing feel, then by all means you will want to step up to either the DS Dual Sinter or Dual Carbon pads. But for the sport rider who needs strong, consistent braking performance on the track, coupled with excellent feel on the street, the SBS RS Sinter pads are definitely the way to go. I am very impressed; it seems that the SBS engineers do know exactly what they’re doing! For additional information, visit SBS. Sintering is the process of fusing metallic particles together under heat and pressure. For brake pads, it blends various other elements to optimize friction and wear life. Sintered brake pads have become standard on almost all motorcycles from the major manufacturers. They are typically paired with stainless steel rotors as they last longer and typically handle the heat better. The two-character labeling on brake pads is derived from the Chase Test (also known as the SAE J866A test) where a 1″ square piece of friction material is put on a Chase machine, and using a specific formula it is subjected to varying conditions of load, temperature, pressure, and rubbing speed to test the coefficient of friction. As friction is affected by heat, the first letter of the code represents the normal temperature friction coefficient, while the second letter of the code represents the hot friction coefficient based on a fade test (when the brake gets too hot) and then recovery (when the brake starts to cool down again). C = less than 0.15. So an HH pad might be ideal for sport or track day riding, but it could be too aggressive (grabby) for commuters. At the same time, racing brake pads are unsuitable for the street because they never reach their optimum operating temperature and simply won’t have the needed stopping power.